How do we disciple people? How do we reach the unchurched/dechurched? What 3DM does is take 30 years of learning from a very post-Christian England context, as well as penetrating Biblical insights, and come alongside churches and organizations who are finding the North American mission field more post-Christian with each passing day. I was struck by this train of thought (sounds painful, I know, and often it is). Let me tell you a story. When I first graduated college and went into the world of professional ministry, I spent seven years doing youth ministry near Seattle. The culture in the Pacific Northwest is as unchurched as anywhere in the U.S. I got used to seeing my Christian identity as a minority thing in that culture, got used to going to parties where it was a rarity to meet another Christian, got used to Christian kids every day having to live out their faith in a non-Christian -- and often anti-Christian -- environment. At first it was a shock for me, because I grew up in a community where the church was the center of the community in social, spiritual, physical, and emotional terms. Now in the Northwest, I was confronted by the fact that the church was very much out on the margins. Then I noticed something. I noticed that there were really two kinds of churches. Some churches were refugee churches, really trying to hold onto their power and the way things used to be while the culture went to hell around them. Others were engaged churches, churches that got involved in the community, churches that delighted in the fact that they were rubbing shoulders all the time with those who didn't know Jesus. The two kinds of churches really boiled down to churches that retreated and churches that advanced. The advancing churches were vibrant, strong, and healthy. When we moved back to the Twin Cities in 1995, I was overwhelmed by a few trivial experiences that reminded me that my cultural context had changed. I remember vividly standing in the checkout at a local grocery store listening to two teenage girls talk about their plans to go to Confirmation that evening. In seven years of youth ministry in Seattle, I'd never had that experience. I was back in a place where the church was much more integrated with daily life for a large portion of the population. I also noticed, though, that the churches in the midwest were full of complacent people. They valued their churches, but they didn't get too excited about faith. It was just part of life. This attitude permeated the churches, from the preschools to the pastors. Church was just one of those institutions. The church held a privileged position, and everyone -- more or less -- recognized its importance. But change was coming. Having recently lived in an environment where the church was losing the culture wars in a big way, I recognized the symptoms. Right here in the Twin Cities, community soccer teams practiced on Sunday mornings. Cable television provided more and better entertainment than any church. Social networks revolved more and more around shared activities (bike clubs, rock climbing groups, dance classes, athletic teams, gyms, neighborhood block parties) rather than around church activities. The church was slowly, almost imperceptibly, drifting to the margins of the culture. In the last fifteen years, I've watched that process continue. Churches struggle to compete with travel basketball and Facebook and the lake cabin, and most of the time churches are losing that battle. Complacent members see less and less need to attend worship regularly, or they attend when there's nothing else going on. Confirmations and baptisms and weddings happen in the church more often as a nod toward a previous generation's tradition rather than as the outgrowth of a living relationship with Jesus Christ. So I think these guys at 3dm are onto something. They're looking at what works in Europe, recognizing that the same trends are at work in the United States. The church will not hold back the tide of cultural drift. We've lost that battle already. It's time to change tactics, to adopt a new strategy. Churches need to become subversive groups within a non-Christian culture. We need to worry more about passionate faith in ourselves rather than trying to lobby for policies within the wider culture. Disciples will be made through individual and small group relationships rather than through legislative action. The way we do church has to change. In fact, it has changed. Those who gather on Sunday mornings as a nod to the church of the 1950's have missed Jesus as he goes out to seek and save the lost. They may be wonderful social clubs, even Christian social clubs, but they are not churches. The church that is led and enlivened by the Holy Spirit is a church that is struggling every day to keep up with Jesus, to figure out how to leave behind more and more of our baggage and travel light with him. A day to remember. As children we didn't understand -- it was about meeting down at the church at noon, standing around outside waiting for the soldiers to show up. They got out of their cars when they came, grim men in various uniforms, carrying flags and rifles. We all stood on the northwest corner of the church, looking out over the headstones, and the soldiers lined up with their rifles. One man spoke orders in a voice just under a shout, a voice you knew could be heard through chaos and fear. Three times the rifles fired; three times we covered our ears at the report. A bugler played taps while the soldiers stood at attention, and when the final order was given and the men went back to their cars, we kids scrambled in the grass for the shell casings. Then everyone turned back to the church doors, and we went downstairs for the potluck. The soldiers came down, too, but now they were smiling and talking as though they were real people, as though they were neighbors and friends and farmers and fathers. Outside in the late May wind the headstones remained impassive. Here is the last letter he wrote home from England. I was so glad to get your letter last night. I’ve been trying to write home quite often. I hope you get them. I don’t know when I will get a chance to write again. Don’t worry about me if it is awhile before you hear from me. The years I’ve been in the Army have been pretty rough but I’ve managed. All along I’ve felt the power of the prayers of my dear mother. And I feel that God will be with me in the battles to come. I’ve been training to fight and fight I will. It is my business. I am unafraid to go into combat. Two years ago the thought would have scared me. In fact I’m quite anxious to meet the enemy, but I will want to come home some day, get married and enjoy a quiet peaceful life. The thoughts of home are indeed pleasant. They are fond memories. One of the biggest things the Army has done for me is to appreciate my home, my parents and brothers and sister. Everybody made it pleasant for the other person and that’s what a home should be. I’ll write next chance I get and if I can, I will send a cable gram. Tell Alberts hello, also Louise and the other folks down there. It would sure be fun to see them all again. I’m going to write a letter to Elsie too tonight. I’ll have to forget about writing to the other people that I owe letters to. Cheap grace means grace as a doctrine, a principle, a system. It means forgiveness of sins proclaimed as a general truth, the love of God taught as the Christian 'conception' of God. Anintellectual assent to that idea is held to be of itself sufficient to secure remission of sins.... In such a Church the world finds a cheap covering for its sins; no contrition is required, still less any real desire to be delivered from sin. Cheap grace therefore amounts to a denial of the living Word of God, in fact, a denial of the Incarnation of the Word of God. If you read the last post here and wondered about the difference between "eisegesis" and "exegesis," click on the link to the right that says, "Iron sharpens iron." This is an old column from 2009 that talks about how to get started reading the Bible for what it says rather than what we want it to say. What do you do when the world doesn't end? My favorite part, of course, is "The Bible guarantees it!" There are a great many things the Bible does, in fact, guarantee. One of them is that you cannot know the timing of Jesus' second coming. Yet interpreter after interpreter comes up with some hare-brained scheme for identifying when Jesus is returning, in spite of the fact that he said we couldn't know. One well-meaning friend of mine said in all sincerity, "Jesus said we can't know the day or the hour. I do think if we are paying attention, though, we can know the year." Talk about missing the point! 1. HC believes he has identified with great precision when Noah's flood occured. 3. In 2 Peter 3:8 the Bible says that "with the Lord one day is as a thousand years, and a thousand years is as one day." 4. So, in a great leap of reasoning, HC says that the seven days Noah's family waited in the Ark should be multiplied times one thousand years to predict the end of the world. 5. May 21, 2011, is (according to HC) 7,000 years to the day after the flood waters started pouring down on the earth. See? It all makes sense. NOT. Camping dealt with the whole idea that Jesus said we couldn't know. He said that applied only up until 1988, when the era of the church came to an end. I could find no reasonable explanation why he thought this to be the case. What this sad ordeal all comes down to is this. When you read the Bible, don't read your own desires and interpretations into it. Scholars call this "eisegesis" which means, literally, that you read your own truth into the text. Responsible Bible interpretation is called "exegesis" and this means reading out of the text what it means. So what does the Bible repeatedly say about trying to predict the end of the world? DON'T DO IT. This applies to many other areas as well. What does the Bible repeatedly say about, for example, debt? It's dangerous and will get you into trouble. Yet we think our credit card or our home equity line of credit is a gift from the bank to us. Why don't we read our Bibles and say, "Oh, God already spoke to this. His word clearly says this 'gift' of debt is going to get me in trouble. I'll trust him on this one." There are so many questions these days where we choose to make our own decisions because it makes sense to us rather than submitting to what God says is true. Sometimes this is just ignorance, like the guy who told me the other day he's a pretty good person and has done his best to live in a way that pleases God, so he thinks if this rapture thing really does happen that God will be good to him. I don't think he knew how unbiblical his position was. Sadly, others who really should know better choose to go with what makes sense to them rather than what God teaches in his word. This happens most often when our culture has chosen to go its own way and leave biblical truth behind. (Accumulation of goods -- homes, toys, cars, land, wealth of all kinds, is one example among many in which our culture pursues its own "truth" in opposition to the Bible. There are lots of others.) In this case, there are all kinds of sources of information and "wisdom" coming from the voices of the culture that sound reasonable, so we choose to listen to them instead of the Bible. We tell ourselves, "This is just the way life is." And because it makes sense to us, we merrily follow the culture and we bit-by-bit walk away from God's word. Powerful story of the song "How He Loves" by John Mark Macmillan. Okay, so a side comment on the lyrics. Originally the lyrics in the second verse say, "Heaven meets earth like a sloppy wet kiss." I vividly remember the first time I heard this song. It was at the late service last summer at Central Lutheran Church -- well, actually, at Lions Park in Elk River, just across the street from Central, because that's where we hold the outdoor worship service in the summers, there in the big amphitheater. Kaycee Robertson was leading worship and she had lyric sheets printed up of this song and at first I thought, "I'm not sure I like this song." Then as it went on, and the chorus was "Oh, how he loves us" over and over like a hammer pounding on my heart until I actually realized that Jesus truly does love us, really, not just like we say it on Sunday mornings in the sanctuary but for real ... I started to like the song. Then we started the second verse, which says, "We are his portion and he is our prize / drawn to redemption by the grace in his eyes / if grace is an ocean, we're all sinking / so heaven meets earth like a sloppy wet kiss / and my heart turns violently inside of my chest / and I don't have time to maintain these regrets / when I think about the way, he loves us ..."
And I thought, "sloppy wet kiss"?! What's going on here? Then I looked at the lyric sheet and I realized, this is talking about the incarnation of Jesus. It's talking about what the prophets had foretold so many centuries before, how Jesus became flesh, and in that becoming, heaven -- the state of being in which God is sovereign over all -- truly does meet earth, and it truly is like a sloppy wet kiss. It's messy. It's intimate. It's tangible. And it does make my heart turn violently inside of my chest. Jesus becoming human to live and die and rise for me is a mess, but he did it anyway. So when the David Crowder Band redid the song and changed the lyrics to "heaven meets earth like an unforeseen kiss" I was not happy. Because Jesus' incarnation was not only foreseen, it was predicted. When he was born and laid in a manger in Bethlehem, there were dozens of prophecies being fulfilled. It was NOT unforeseen. So I prefer the original version instead of the sanitized one. The explanation I heard (third-hand) is that the David Crowder Band didn't want a song that would stop people in their tracks and make them say, "Huh?" in the middle of worship. But sometimes I think that's exactly what we need to do in the middle of worship. We need to stop and say, "Huh?" because there's so much we take for granted. We come into the presence of the God of the universe, the Almighty and Ever-living One, and he longs for nothing so much as a personal relationship with us, and we just gloss over that and wonder how long the sermon is going to be today. We need to be jarred a little. We need to have our sensibilities shaken up and our perceptions challenged and our preconceptions shattered by the fact that Jesus got into the middle of our mess, the mess that we usually try to hide from everyone including our best friends. To make my point, read the Bible. There is LOTS of stuff there that stops you in your tracks and makes you say, "Huh?" Here's a partial list off the top of my head. 1. Why does God want to create stuff? 2. How does God go walking in the garden in the cool of the day? 3. Why is Eve made from a rib? 4. Why does God warn Cain and then Cain kills Abel anyway? 5. Why does Cain -- exiled to wander the earth -- immediately build a city? 6. Who does Cain build a city for? 7. Skipping ahead a bit, why doesn't Noah, who was so good he pleased God, say anything in the story until he curses his grandson Canaan? 8. Why does God make a covenant with Abraham using a bunch of split carcasses? 9. Who is Melchizedek? Is it God in human flesh before the incarnation? So, God the Son who will someday become Jesus, experimenting with incarnation before it gets trendy? Or is it just some pagan king of Jerusalem? 10. Why does Jacob spoil his son Joseph so bad that all the other sons hate him? Is Jacob really so clueless? 11. How come God doesn't lose patience with this bunch? How is it possible that he's willing to put up with all their garbage? 12. Why does the book of Exodus affirm the midwives for lying to Pharaoh? 13. Why does Moses resist God to the point of making him tear his hair out, claiming that he can't speak well, and then when Moses and Aaron get in front of Pharaoh Moses does almost all the talking? 14. 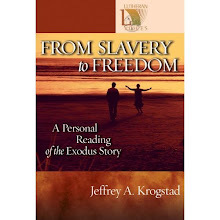 Why does the Exodus take place in the most well-documented civilization of the ancient world, but yet we have no secular record of the Israelites' slavery or their escape? 15. Why are the Israelites so amazingly obtuse? Why can't they just once get it right? Why do they keep grumbling, rebelling, complaining, and messing up in every conceivable way? 16. Why does Moses get banished from the Promised Land for one tiny mess up after the Israelites have been pardoned time and again? 17. Skipping way ahead, why doesn't Job ever learn about the bet between Satan and God over whether he'll curse God or not? I'm going to stop at 17. You see, there are hundreds -- thousands -- of "Huh?" moments in scripture. If we're going to relate to God we'd better get used to them. We didn't even get halfway through the Old Testament. Sloppy wet kisses. It's as good a phrase as any for this messy way God gets involved in the details of our lives, and how he doesn't fix stuff, he just gets into the middle of it with us. If you haven't watched the video at the top of this post, go back and click on it. It's worth your time. A decade or so ago, a friend of mine introduced me to an excellent question. She was from a Nazarene background but had started attending our mainline Lutheran church in Williston, North Dakota. She watched us carefully for a couple years and decided there were some really good things about these Lutherans, and there were some things that fell far short. One day she was explaining some of her perceptions to me and we got to talking about communion. She explained that in the tradition in which she was raised, communion was an afterthought. Nobody took seriously that anything spiritual happened in this bread and wine transaction; it's just something Jesus said to do, so we do it. "But you Lutherans," she said, "do it different. You take it seriously. You really believe Jesus is there, and he's as good as his word to do something when you take communion." Then she went on to introduce me to her excellent question. "Jesus said that you can evaluate preachers by the fruit they bear," she said (see Matthew 7:15-17). "Well, I think you can do the same thing with a church's doctrine. You ask, 'What fruit does this bear?' And then you see what kind of fruit that church's teaching produces." She went on to tell me that in her eyes, my church's approach to communion bore good fruit. "You can see it in people's eyes, in their faces, in their lives -- they connect with Jesus in this meal. The church I was raised in, we just wanted to get it over with because it didn't mean anything anyway. But people here take it seriously, they take their time, and God honors that. Communion done this way produces good fruit." I have come back to this excellent question over and over and over again. What fruit does it bear? When I look at a new evangelism program or a method of Bible study or a denomination's political stance or a preacher's leadership style, I often ask, "What fruit does it bear?" Very often I look at my own life and I ask about some area of my work or a habit that I'm trying to evaluate, "What fruit does it bear?" This question goes deeper than just wondering if a thing is functional. A church may find a creative way to do evangelism that brings dozens or hundreds of people through the doors. It seems to be functional, at least in terms of numbers. But what fruit does it bear? This asks a deeper question. Does this influx of people produce disciples -- people who are following Jesus? Or do we just have a crowd assembled in one place for some other reason? We may not like this question. We would rather see ourselves as successful, but bearing fruit is often different than success. Success is so often measured in terms of numbers -- numbers of people invited, numbers of pounds lost, numbers of dollars brought in, numbers of homes built, or whatever. But fruit has more to do with long lasting change of character, change of the course of a life, change of ongoing relationships. What fruit does it bear? This is the question that drives us to discontinuous change, because this question so often points out that what we have been doing forever and ever, amen, is no longer producing good fruit -- if ever it did. It is possible that at one point, having a pastor lead a congregation of roughly a hundred and fifty people, gathering them once a week to preach and teach at them and receive an offering from them, provided a fruitful leadership model. Today, however, that same model tends to produce passivity. What has changed? Many things. Bottom line is, what once may have been fruitful no longer produces good fruit. This is the point at which we can keep in lockstep with tradition and The Way We've Always Done Things, or we can make strategic, discontinuous change. Often it is not hard to imagine discontinuous change. We can envision a different future, imagine a fruitful pattern, see a better way. We are just afraid to take the leap, stick our necks out, make the required change. It is risky. So the biggest barrier to discontinuous change is first about wisdom -- wisdom to discern the right direction to move -- but then it's mostly about courage. Apologies to loyal blog readers! I have been unable to post new entries for several days. Some kind of glitch in the world of the people who make this blog possible, and unfortunately beyond my ability to control. SOON I will have new, thought provoking stuff for you to read, since I can now get back online and post again! In the meantime, I have built a flamethrower. This is why the internet is SO necessary in our modern world -- it keeps dangerous people like me from exercising our full destructive potential. Karl Marx said that religion is "the opiate of the masses", meaning that religious practices and ideas tranquilize people and make them oblivious to the fact that they could really change their circumstances. Later, in the 1980's, the comic strip Bloom County portrayed a television quietly gloating, "Karl Marx hadn't seen anything yet!" The internet goes a step farther -- we quietly numb ourselves into oblivion with interactive entertainment, gaming, shopping, and "social networks" (think Facebook) on demand, at the click of a finger -- and we think we are doing something important. It's May. So here's a thought: Get off the computer for a while. Find an eight year old. If you don't have an eight year old, you can borrow one. (Parents of eight year olds are almost always willing to loan them out, especially if someone else is willing to feed them in the bargain.) Take the eight year old to the hardware store. Wander the aisles looking for cool stuff. (For an eight year old, hardware stores are like treasure chests full of cool stuff.) See the store from the kid's perspective. PVC pipe is not for plumbing; it's the stuff blowguns are made of. If you buy the right size PVC pipe and cut a couple two foot lengths and go to the grocery store and buy a bag of the multi-colored miniature marshmallows, you can have all the fun of paintball with a lot less pain and mess. Or if you've got the really big PVC it's a ready-made tunnel. You could build a submarine out of the stuff. I was in Johnson's Hardware Hank in Zimmerman today -- I love that store -- and they have a whole display of rubber-band powered, wind-up balsa wood airplanes. Many eight year olds have never assembled, wound, or released a balsa wood airplane in their lives. This is a tragedy. Look at trailers, or storage sheds, or lengths of rope or various kinds of plywood and ask the kid, "What could you think of to do with this?" Spend time in the stovepipe section or the garden tools. See it through the eyes of wonder and exploration. If you're brave enough, look at the propane cylinders and the associated gadgets. Oh, my goodness. When you're done at the hardware store (which, if you're doing it right, means after you've been kicked out), find someplace that sells ice cream cones, preferably in multiple flavors. It's May. Go have some fun.